Look out New Orleans, refrigerant recovery speed and efficiency are coming for you! Rapid Recovery of New Orleans is your Total Solutions® provider of refrigerant recovery services. Our team makes Clean Air Act compliance simple and convenient for the HVAC, refrigeration, demolition, government and marine industries. 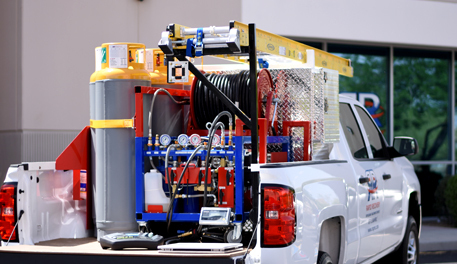 We offer the industry’s fastest jobsite refrigerant recovery, on-site cylinder service, refrigerant delivery and competitive refrigerant buyback. All of our services include detailed EPA documentation and a year end report that helps to keep the EPA out of your wallet and off of your back. I grew up in the great city of New Orleans and am proud to call it home. I am dedicated to serving New Orleans and all its surrounding areas. From the smallest refrigerated units to the largest systems, we simplify your recovery process. We come to your shop or jobsite with AHRI certified gas powered refrigerant recovery equipment designed to achieve speeds over 10x faster than a typical electric unit. Receive the industry’s fastest refrigerant recoveries on any size project from a single roof top unit to an industrial chiller with thousands of pounds. All of our services are backed by an industry leading refrigerant buyback program. Let us demonstrate our refrigerant recovery solutions for you today. Become part of our growing customer base in New Orleans and help us improve the environment one recovery at a time! Contact your local New Orleans team today to get a quote on your next project.